STORIES OF THE STOCK MARKET, OCCASIONALLY HILARIOUS TO OBSERVERS (LIKE US) BUT NOT FUNNY TO THOSE WHO ARE INVOLVED (WITH THEIR LIFE SAVINGS). The 1981-2 Malaysian tin market fiasco your blog is feel good...... Malaysia was the world’s largest tin miner. Then, there was actually a global organization, made up of tin consumer and producer countries, to maintain tin prices. And Malaysian government was sold tin and earns money and improves his financial condition.Watch a free video on Gold IRA. Hi, I am currently working part time for an advertising company to source for advertising space on Singapore finance blogs. I have recommended your site to my company. SBC hi nice to meet you in your blog, please visited back my blog and leave your coment for me. 幸福是人人都要，又怎麼可能都歸你所有？要知道這世界幸福本來就不多........................................ wonderful................................................... Hi buddy, I discovered your web-site from wikipedia and study a couple of of the other weblog posts. They're completely great. Please maintain it up. http://www.stocktale.com A nice financial site as Stocktale.com I have a web site where I give advise on penny stocks and stocks under five dollars. I have many years of experience with these type of stocks. If their is anyone that is interested in these type of stocks you can check out my web site by just clicking my name. I would like to take a moment to talk about low price stocks not classic penny stocks or stocks under one dollar the term most people most often think of when the word penny stock is used. The single most important thing that investors must realize about low price stocks or stocks under five dollars is this’ their are companies of really decent quality trading under five dollars’ but for every one company trading under five dollars that is of decent quality their are maybe ten of poor quality. So the really big difference between those investors that are tremendously successfull when it comes to investing in low price stocks and those investors that lose enormous amounts of money investing in stocks under five dollars’ is having a great deal of knowledge and experience when it comes to low price stocks’ or having a total lack of knowledge and experience when it comes to low price stocks. Finding quality stocks under five dollars requires a lot more research than finding a decent stock above ten dollars. I have a web site where I give investment advise on penny stocks and stocks under five dollars. If theirs anyone interested in these type of stocks you can check out my web site by just clicking my name. I would like to comment about penny stocks what most investors fail to realize about so called penny stocks is that stocks trading under 1 dollar are really not worth messing with the real bargains are stocks trading between 1 dollar and 5 dollars a share. I recenly sold my shares in vonage holdings corporation for 5 dollars. I bought the shares in 2009 for 37 cents. this was a rare exception to the general rule most of the stocks trading under 1 dollar are not good investments. the way that you find low priced stocks that are worthy investments is to have as much knowledge and experience as possible about these type of securities. only than can you profit tremendously from these stocks. I believe that theirs always bargains in the market. Nice post. Thanks for sharing. Website;http://honestloan.ulcraft.com/ Do you need Finance? Email: capitalfundingsolutinfo@gmail.com $$$ GENUINE LOAN WITH 3% INTEREST RATE APPLY NOW $$$. Email: shadiraaliuloancompany1@gmail.com Thanks for sharing this! My name is Mrs Sharon Sim. I live in Singapore and i am a happy woman today? and i told my self that any lender that rescue my family from our poor situation, i will refer any person that is looking for loan to him, he gave me happiness to me and my family, i was in need of a loan of $250,000.00 to start my life all over as i am a single mother with 3 kids I met this honest and GOD fearing man loan lender that help me with a loan of $250,000.00 SG. Dollar, he is a GOD fearing man, if you are in need of loan and you will pay back the loan please contact him tell him that is Mrs Sharon, that refer you to him. contact Dr Purva Pius,via email:(urgentloan22@gmail.com) Thank you. Private Lender Bentex Funding Group Ltd.
My name is Mrs Sharon Sim. I live in Singapore and i am a happy woman today? and i told my self that any lender that rescue my family from our poor situation, i will refer any person that is looking for loan to him, he gave me happiness to me and my family, i was in need of a loan of $250,000.00 to start my life all over as i am a single mother with 3 kids I met this honest and GOD fearing man loan lender that help me with a loan of $250,000.00 SG. Dollar, he is a GOD fearing man, if you are in need of loan and you will pay back the loan please contact him tell him that is Mrs Sharon, that refer you to him. contact Dr Purva Pius,via email:(urgentloan22@gmail.com) Thank you. Are you tired of seeking loans and Mortgages,have you been turned down constantly By your banks and other financial institutions, We offer any form of loan to individuals and corporate bodies at low interest rate.If you are interested in taking a loan,feel free to contact us today,we promise to offer you the best services ever.Just give us a try,because a trial will convince you.What are your Financial needs?Do you need a business loan?Do you need a personal loan?Do you want to buy a car?Do you want to refinance? Do you need a mortgage loan?Do you need a huge capital to start off your business proposal or expansion? Have you lost hope and you think there is no way out, and your financial burdens still persists? You will be sent the company loan terms and condition immediately.Be assured that your loan application will be handled with privacy and in a professional manner and you will receive a prompt answer to your request. Be assured that your loan application will be handled with privacy and in a professional manner and you will receive a prompt answer to your request. Email: infotrivagofinance@vivaldi.net call/WhatsApp us +1(316)925-6026 website https://trivagofinance.wixsite.com/home for easy application. Do you need long or short term first class financial offer of different categories such as business, personal, home, auto, student, debt consolidation finance e.t.c. no matter your credit score. We are guaranteed in giving out financial services to our numerous clients all over world. With our flexible lending packages, funds can be processed and transferred to the borrower within the shortest time possible, We are certified, trustworthy, reliable, efficient, fast and dynamic. E-mail: infotrivagofinance@vivaldi.net call/WhatsApp us +1(316)925-6026 website https://trivagofinance.wixsite.com/home for easy application. Viber: +16316333962 Private Lender Bentex Funding Group Ltd.
Mr. Abdul Muqse Private Lender Bentex Funding Group Ltd. This is Carol, a webmaster of some quality financial websites having good internet presence and traffic. As I found your website is relevant to my one, I'd like to have you as my link partner. I am ready to give you some healthy links (both text and banner) from content pages (pr1/2/3) of my websites. Mr. Abdul Muqse The Bretton-Woods Currency System and Its Collapse excellent blog, the bretton woods article was very well and explained. My first visit her, keep up the good work. Mr. Abdul Muqse The 1980s US Savings and Loan Crisis US economy have been suffering, after the 1980s US savings and loan crisis, a new-minted Resolution Trust Corporation took over insolvent financial firms and over time sold their assets. http://sites.google.com/site/thailandstockinvestment I have a web site where I give investment advise on penny stocks and stocks under five dollars. If theirs anyone interested in these type of stocks you can check out my web site by just clicking my name. I would like to comment about penny stocks what most investors fail to realize about so called penny stocks is that stocks trading under 1 dollar are really not worth messing with the real bargains are stocks trading between 1 dollar and 5 dollars a share. I recenly sold my shares in vonage holdings corporation for 5 dollars. I bought the shares in 2009 for 37 cents. this was a rare exception to the general rule most of the stocks trading under 1 dollar are not good investments. the way that you find low priced stocks that are worthy investments is to have as much knowledge and experience as possible about these type of securities. only than can you profit tremendously from these stocks. I have been doing my own personal investing for quite a number of years and would like to have meaningful discussions on my favourite subject online with others sharing the same interest. It is interesting to read about another speculators' attempt to control a particular segment of the commodities market, given all the heated arguments recently about how much oil price dynamics are being driven by futures speculation. This attempt was in 1981 and ironically it wasn't long after the Hunt Brothers' failed attempt to corner the silver market. The Malaysian government(!) was the main protagonist, and its objective was decidedly altruistic: to support tin prices to "protect the national interest" (Malaysia was the world's largest tin miner). Then, there was actually a global organisation, made up of tin consumer and producer countries, to maintain tin prices. This was known as the International Tin Council (ITC); it acted on behalf of the various members to buy up surplus tin stocks to maintain the price at a steady level. New substitutes for tin had emerged within its traditional applications: the advent of aluminium containers, the use of protective polymer lacquers inside cans, and increased recycling by industry, had all caused the demand for tin to stagnate considerably in the early 1980s. In 1981, the ITC consumer members rejected producer demands for higher prices. The Malaysian government, on advice from a Swiss commodities broker Marc Rich, then unilaterally commenced secret operations to buy tin futures on the London Metal Exchange (LME) from July 1981 till early 1982. Initially the operations succeeded in supporting tin prices, which rose sharply from <7000 GBP/ton to nearly 9000 GBP/ton within 8 months. The tin price did not rise more because traders on the LME were short-selling on the other end. But cracks began to appear, as the natural consequence of rising prices was rising supply; in addition, the US announced its intention to sell part of its 200,000 ton stockpile in November 1981 --- which drew more short-sellers. It was around this time that the Malaysian/Swiss partners switched tactics from a price-support operation (through buying futures) to attempting to corner the tin market through making spot purchases of physical tin for cash. This would, hopefully, squeeze the short-sellers into paying much higher prices when they would find no tin to cover upon contract expiry. But the switch in strategy dramatically increased the stakes, because as opposed to only needing to post 10% margin for futures, the cornering operation's spot buying needed 100% cash for immediate settlement. Then all this physical tin needed insurance and storage --- additional costs. Where did the money come from? Loans from state-linked banks Bank Bumiputra and Maybank of course --- another example of the many legendary shady interlinkages between industry and government in Malaysia. It turned out that the people who got squeezed were the aspiring cornerers themselves. Those who had sold short futures contracts did indeed find it hard to locate tin to deliver as settlement day approached. This created a crisis on the LME, with traders facing the prospect of default and ruin. As the short squeeze loomed in February 1982, the LME changed its rules --- it declared that traders who failed to meet sales contracted could pay a fine --- 120 GBP/ton --- instead of supplying physical tin, meaning short sellers could avoid paying steep premium to the cornerers, which could have been >1000 GBP/ton. There was a collapse in tin prices following the ruling, culminating in massive losses for the Malaysian/Swiss partners. At the same time, tin supplies continued to come from the US stockpile while tin users began reducing stocks due to high prices and a continuing global recession. The subsequent price collapse from 9000 to 7000 GBP/ton within a month due to the rule change cost the partners a paper loss of >500M RM even as they were stuck with 50000-60000 tons of tin in physical stock that they had never meant to keep long-term. Worse was to come, as fast falling tin prices forced the ITC (the earlier-mentioned tin cartel) to begin massive intervention to protect the artificially high floor price until it too ran out of funds in 1985, defaulting on 900M GBP(!) loans and triggering another tin price collapse. Ultimately, thousands of Malaysian mine workers were laid off and hundreds of mines closed due to the collapsing tin prices that rendered many mining operations no longer viable. The "good intentions" of the Malaysian government had boomeranged cruelly back on itself, and from the mid-1980s onwards tin would no longer be a key export for Malaysia that it had been for decades extending back to British colonial rule as an indirect result of the 1981 fiasco. For bystanders it was a lesson not to interfere in or manipulate normal operations of the market and attempt to go against the fundamentals of demand/supply. For the Malaysian government and Dr Mahathir (the cornering operational plans and political support went up to the highest levels), it reinforced their belief that the West was not to be trusted --- in 1986 when the scandal was finally publicly admitted by the Malaysian government, on persistent allegations by opposition leader Lim Kit Siang, Mahathir defended the intervention by contending that only "massive cheating in the London Metal Exchange" had deprived the government of profits from its trading (the LME defended itself by asserting that the exchange was required by its own rules to block an apparent attempt to corner the market). There was an accompanying scandal following the 1982 fiasco where the Malaysian government scrambled to find funds to cover back the loans it had taken from the state-linked banks to finance its cornering operations, which involved the use of Employee Provident Fund (EPF) pension money to play the local stock market. That is another story for another day. A key lesson from the 1981-2 fiasco, together with the similarly ill-fated Hunt Brothers' silver corner around the same time, is the wild card of exchanges making rule modifications in response to extreme market conditions that can instantly crush any market manipulation operations. Tin or silver were relatively small markets. It is hence difficult to imagine someone attempting to manipulate the oil markets, for example, with its infinitely bigger liquidity on top of wild losses should the exchange decide to tweak its rules again if it should perceive market irregularities. Who says you can't change the rules? I decided to research and document the history of this company/stock after reading an online discussion about a certain prominent member of the local property industry and his version of his involvement with L&M in the 1990s. Its history is chequered, and the more I read, the more intrigued I became. It is the perfect example of a political stock gone wrong. L&M was a prominent structural engineering firm in the 1970s and 80s, and listed on the then SES (predecessor of SGX) in 1983. L stands for Paul Lim, M for Richard Mulholland; they were the two prime drivers of L&M as it continued to expand market share into the 1990s, when they started to diversify into property development and investments. When Guthrie GTS mounted a takeover of L&M Group Investments in the early 1990s, it was a local construction giant with overseas projects in ASEAN and Asia turning over >$200M per year. Profits were razor-thin though, at about $1-2M per year. Nonetheless, the founders exited the scene with good money as new management came onboard and a new chapter began. The insipid earnings performance continued under Guthrie for the next few years, even as turnover continued to grow to >$400M by 1995. Share price accordingly hovered around the $1 mark, though during the great bull run of 1993-94 it reached nearly $2. Then in late 1995 ownership changed hands again. 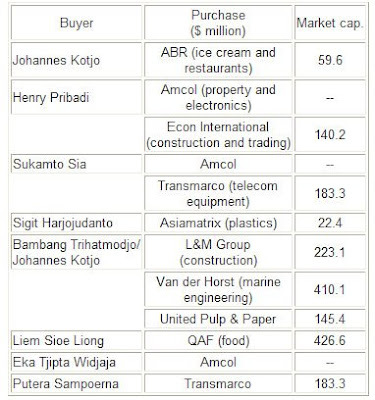 As seen in the table, L&M was acquired by an Indonesian consortium led by Johannes Kotjo, former CEO of the Salim Group, with Bambang Trihatmodjo - the elder son of President Suharto - also being one of the shareholders. The buy-in price was close to $4 --- a level that would never be seen again. There was much hope that the Suharto ties would bring big fat contracts from the Indonesian government, but earnings post-acquisition never really took off and the effect was that share price soon went south to half the acquisition price by 1997. That was still not too bad because the emerging markets of Asia were firing on all cylinders then, and the general market was buoyant and relatively forgiving, especially towards market darlings with strong political links (and hence growth prospects, it was assumed). In early 1997 the Soeryadjaya family took over control of L&M, with the former owners exiting at a big loss. Next better (Indonesian) player. You have to say that the Soeryadjayas, they who lost the Astra empire in the early 90s, really seem to be cursed with bad luck. The troubles at L&M really began, as with so many other construction/property companies at that time, with the 1997/98 Asian financial crisis. For years, L&M had been operating on high leverage; by 1997 its short-term loans equalled equity funds and interest expense was nearly half of operating profit. Thus when the Asian currencies took severe haircuts during the crisis the balance sheet liabilities suddenly ballooned. The company faced problems refinancing its loans, which it kept having to extend month by month. To compound its issues on hand, it faced legal suits and claims during this period for certain overseas construction projects amounting to tens of millions of dollars. In 1998, it was forced to make provisions and writedowns amounting to $50M, and wound down its property and infrastructure division. In mid-1999 the company appointed an advisor to restructure its loans; there were questions whether the company could continue as a going concern. The share price sank to below 25 cents at the bottom (1998). True to its past history, the market fortune of the stock, in contrast to its actual operational performance, did a revival again in late 1999. Again, its revival was tied to political developments in Indonesia. Abdurrahman Wahid was the new Indonesian President, and the Soeryadjayas had long had business ties with him. By fair means or foul, L&M was chosen as the company to develop and manage Cybercity in Jakarta, Indonesia's answer to Malaysia's Cyberjaya, Hong Kong's Cyperport (under Richard Lee's Pacific Century), and of course USA's Silicon Valley. L&M was poised to become the top IT and Internet infrastructure player in Indonesia. Those who have been through the dot-com mania of 1999-2000 would understand the impact of such a possibility on investors' imaginations, even when the company involved was still in the midst of a loan restructuring process. The stock jumped from $0.60 to $1.50 in 3 months to January 2000, as even veteran investors started to buy into the idea of it being the beneficiary of Indonesian political connections both current and future. This was further reinforced by the entry of Bambang Sukmonohadi as a shareholder; Bambang was then Vice-President Megawati Sukarnoputri's father-in-law. Rumours swirled of Microsoft, Lucent, Singtel, PCCW joining L&M in the Cybercity development, further reinforcing investor optimism. Unfortunately the dot-com mania ebbed at the turn of the millenium, and with it the plans for Cybercity mysteriously died away. There had been some stock sales by insiders in the meantime. However, the company managed to keep itself in the public eye over the next 1-2 years, with the announcement of deals many of which never materialised: plans to list L&M's geotechnical division; plans to buy Singapore-listed Van Der Horst, Presscrete, Link Islands and Malaysia-listed Mitrajaya that were all later cancelled; several agreements in Indonesia, including a joint venture to promote and build a mass rapid transit transport system in Jakarta, a letter of intent to supply and purchase sea sand (from Indonesia to Singapore); acquisition of infrastructure assets of Van der Horst (this one materialised). In the midst of all this, it was indeed impressive that the company still found time to make losses of $30M in FY00 and then follow up with an even more impressive loss of $70M in FY01. By 2001, despite all the huffing and puffing by the enterprising and publicity-savvy L&M management, the share price had dropped to $0.20 under the weight of the bone-crushing losses. With its financial situation rapidly deteriorating and credit facilities tightening, the company found it difficult to deliver on existing contracts as it was unable to pay workers. By 2003, the company had undergone a series of recapitalisation exercises that ballooned its outstanding shares. By then, the company had run up a shattering total loss of $200M over 2000-03. By 2004, L&M was trading at 1 cent as it entered into one of its last placement/debt restructuring exercises that saw outstanding shares balloon to nearly 9 BILLION shares. In 2005 the stock was suspended and the suspension has not been lifted since. The company's profitable assets have since been taken over (eg. geotechnical/piling assets by CSC) and it is difficult to see shareholders recovering any significant value back from the company from here, even if it undergoes an RTO. The company started from a strong position in a strong industry in the early 1990s, and had luminaries like Albert Hong (venerable chairman of RSP Architects) sitting on its board. It then degenerated into a heavily politicised stock under the Indonesians, and its operations never fully recovered from the Asian crisis. Speculators were attracted to its multi-bagging ability that often happened in short spurts (1995, 1999-2000) as well as the political connections associated with its key shareholders; however circumstances have developed such that political stocks have come in for the worst mauling simply because the crony capitalism practised by Indonesia has toned down (mind you, it has never disappeared) after Suharto was overthrown. Companies that hope to profit from economic rent-seeking and do not focus enough on core competencies and operating leanness can easily lose focus; similarly stocks that are based on concept but have little grounding in real profitability will eventually crash to earth. I highlight the plastics sector in this article to illustrate the folly of long-term buy-and-hold without regular monitoring and assessment of industry dynamics, or even the simpler approach of cutting loss or taking profit at certain cut-off points. The failure to identify the cyclical nature inherent in a particular sector, coupled to a stubbornness in refusing to exit before it is too late, can lead to heavy underperformance in a bull market and hence great frustration. This is a convenient sector to track because I follow the sector through my self-created Plastics Sector Index started in mid-2006. By then the sector was already accelerating into its declining stage. But even then, from a starting index of 100, the sector has plunged another 40% through the 2007 market bull and the subsequent bear to hit just above 60 today. For comparison, the STI was up ~35% over the same period, while outperforming sectors/themes like oil&gas and China are up over 60% (according to two other tracking indices I created). Be a patient buy-and-hold investor in the wrong sector and you will be disgusted at the stock market and more justifiably, at yourself. The boom in the plastics sector started in mid-2003 and lasted till early 2005. That they were among the first stocks to charge up in the bull run gives credence to the sector timing view that technology stocks are among the early movers in an economic recovery. Indeed, the plastics sector had been growing revenues and profits consistently even as early as from 2002 onwards, which probably caught fund attention when the global rebound began in earnest in mid-2003. They were riding on the trend of electronics manufacturing being outsourced to Asia, a structural shift which had already seen a major wave of re-ratings on SGX-listed EMS (electronics manufacturing services) companies in 1999/2000 along with major M&A deals; the action moved to plastics moulders in 2003-05. The main sector leaders were Fu Yu, Meiban, Sunningdale, Hi-P, First Engineering. Fu Yu made plastic parts for HP and also Chinese handset companies; Meiban served HP and Dyson; Sunningdale made plastic automotive parts; Hi-P moulded for a diversified customer set and also did downstream contract manufacturing; First Engineering did high-precision components for HP, hard-disk drive OEMs and automotive suppliers. Over 1.5 years from mid-2003 to end-2004, these companies doubled or tripled in price as institutional funds piled in. I have this plastics sector report from Kim Eng in August 2004 at the height of the boom, and its views were typical of bullish brokerage views of the sector at that time. I quote: "Despite rising uncertainty in the electronics industry" (yes, the industry was already stagnating then), Kim Eng was positive because (1) the outsourcing trend; (2) "it is the material of choice in many products, replacing others such as metal and glass"; (3) "Plastic is playing a more important part in product differentiation" (whatever that means); (4) "Plastic component makers are becoming contract manufacturers and capturing the additional value added in the manufacturing process". Generally, it then set price targets of 15-20X trailing, or even forward PE, on these companies. Typical of brokers to fan the flames of bullishness when the going is smooth. How, then, to explain the collapse since mid-2005? Obviously, the fundamentals in the form of earnings drove the collapse. Examining one layer deeper, and consolidating the reasons offered by the various plastics companies since then explaining their profit drops, we find that there was a simultaneous confluence of: drop in demand leading to pricing pressure from customers, buildup in plastics manufacturing capacity leading to excess, and a rise in raw material costs due to continually rising oil prices (plastics is a petrochemical product). Individual companies faced further company-specific problems that exacerbated the dire industry plight for them: for example, Fu Yu faced a meltdown of the domestic China handset makers which were some of its main customers, and later ran into management problems; Hi-P's main customer Motorola went downhill after failing to follow up on the success of its Razr handphone; Sunningdale merged with another moulder Omni Mould and then found it hard to cope with integration and excess capacity. The developments described above lend credence to the view that when it rains, it pours, and thus we should never try to catch a falling knife where sectors or individual companies are concerned (but markets are another matter). Capacity excesses take a long time to work themselves out, and the markets can punish the sector leaders mercilessly in a death spiral: first a PE de-rating as institutional funds sense that the sector has peaked and start to exit, then further price fall as earnings drop continuously, finally a fall below NTA (net tangible assets) as the slide continues (a stock trades justifiably below NTA if its return on equity is too low). Today Fu Yu is trading at sub-20 cents, a fifth of its peak, and faces investigations for management indiscretions. Hi-P is also trading at about a fifth of its peak as profit margins have halved over each of the last two years. Meiban seems to have recovered in earnings but due to sector PE de-rating remains at a third of its peak. Sunningdale trades at half its NTA; at its peak it was trading at 2-3 times NTA. First Engineering had the best ending: it got acquired at $1.00, just a third off its peak at ~$1.40. There is still no respite for the sector: even if the excess moulding capacity has resolved itself or if individual company managements have embarked on new and more effective positioning strategies, the end demand from the Western economies does not look like picking up anytime soon as the sub-prime crisis continues to exact its toll. Currency systems have always been one of the cornerstones of world finance; this has become even more apparent in recent years with globalisation and its accompanying trade and financial liberalisation as pushed mainly by the West. With free capital flows into and out of countries, whether local currencies are fixed or freely floating determines the actions that central banks have to take to maintain status quo, as well as the kinds of stress on the system and its stability. Emerging markets suffered badly due to incompatibility of currency systems versus their ability to manage capital flows in 1997-98. My writeup details the development of the Bretton-Woods currency system after World War 2, and its subsequent collapse more than 20 years later. It gives a perspective on the difficulty of maintaining status quo on the international currency markets. In the 19th and early 20th centuries gold played a key role in international monetary transactions. The gold standard was used to back currencies; the international value of currency was determined by its fixed relationship to gold; gold was used to settle international accounts. This was the classical gold standard. Supplementing the use of gold in this period was the British pound as a reserve currency. The implication of the gold standard and full convertibility was that exchange rates were fixed, and tended to be self-stabilising: under trade deficits a country's gold reserves would be depleted with corresponding decrease in money supply (since it had to be backed by gold) and importing power would decline, while the lowering of prices would boost exports; thus the deficit would be rectified. After World War 2, the Bretton Woods conference was convened to structure the international economic framework for the future. One of the key items was the global currency system. Exchange rate stability was a prime goal; however the classical gold standard could no longer be used because gold production was not sufficient to support burgeoning world trade. What emerged was the "pegged rate" currency regime. Members were required to establish a parity of their national currencies in terms of gold (a "peg") and to maintain exchange rates within a "band" by intervening in their foreign exchange markets (ie. buying or selling foreign money). This was somewhere in between pure fixed exchange rates and pure freely-floating rates. In practice, the world's currencies were pegged to the main reserve currency, now the US dollar, with the latter then pegged to gold at the rate of US$35 per ounce of gold. The US dollar therefore became the key currency of the Bretton Woods system and most international transactions were denominated in dollars from then on. A key reason for this arrangement was that post-WW2, the US dollar was the only currency strong enough fundamentally to meet the rising demands for international liquidity. It was also running a huge balance-of-payments (BOP) surplus; thus, maintaining the Bretton-Woods system necessitated reversal of this BOP flow to meet international dollar shortage. The Bretton-Woods system was highly advantageous to the US which would use the convertible financial system in a system of triangular trade as follows: it would trade (at a tremendous profit) with developing nations, expanding industry and acquiring raw materials. It would use this surplus to send dollars to Europe, which would then be used to rebuild their economies, and make the United States the market for their products. This would allow the other industrialized nations to purchase products from the Third World, which reinforced the American role as the guarantor of stability. The Bretton-Woods system functioned very well for over 20 years. But it was founded on a contradiction. The system would continue to operate while the mass of US dollars circulating in the rest of the world was backed by gold held in the US. But the very expansion of the international economy tended to increase the need for international liquidity in the form of US dollars. That is, the more the global economy expanded, the shakier became the relationship between the dollar and gold. In the 1960s, the dollar overhang—the difference between the dollars in international circulation and the value of the gold backing held by the US—began to grow as a result of increased US investment abroad and military spending (eg. the Vietnam war). The growth of the Euro dollar market (please read up yourself) also meant that growing amounts of financial capital were now able to move around the world outside the control of governments; capital controls to maintain incumbent fixed exchange rate regimes (as under the Bretton-Woods system) would not be effective (a tenet of economics is that it is impossible to balance a fixed exchange rate regime with open capital flows). By 1968, the attempt to defend the dollar at a fixed peg of $35/ounce, the policy of the Eisenhower, Kennedy and Johnson administrations, had become increasingly untenable. Gold outflows from the U.S. accelerated as its balance of payments swung towards zero, a massive reversal from the post-WW2 years. By the early 1970s, as the Vietnam War accelerated inflation, the United States as a whole began running a trade deficit (for the first time in the 20th century). In 1971, as financial assets continued to flee the US and the US economy showed signs of a tailspin, President Nixon finally announced, in August, that the US was unilaterally removing the gold backing from the dollar, effectively spelling the end of the Bretton-Woods fixed-rate system centred on the dollar. The removal of the gold backing from the US dollar was rapidly followed by the abolition of fixed currency relationships globally and the lifting of restrictions on the movement of capital throughout the 1980s. The demise of the gold standard and global fixed exchange rate regime has been blamed for a series of ensuing currency crises. In 1987, differences between US and German authorities over interest rate policies directly contributed to the October stock market collapse. The decade of the 1990s saw the sterling crisis of 1992, followed by the turbulence in bond markets in 1994 and the Mexican bailout of 1994-95. Then came the Asian crisis of 1997, followed by the Russian default of 1998. Many of these were precipitated by countries managing their own pegs that turned out to be overvalued. Under the Bretton-Woods system, their currencies would have been pegged to the US dollar whose value would be backed by gold; value was assured. But then again, the Bretton-Woods system had also met its demise due to internal instabilities as described above. It just goes to show the dynamism of international finance, and why it is important to evolve one's views, beliefs and positions with time. In the midst of a (temporary?) respite from the subprime crisis that enveloped global financial markets in panic over the last two weeks, I find it an appropriate time to look back at a similar crisis that the subprime issue is often compared to: the US savings and loan crisis of the 1980s. There are indeed some parallels that can be drawn between the two. In the US, savings and loan institutions (also known as S&Ls or thrifts) have existed since the 1800s. They originally served as community-based institutions for savings and mortgages for the conservative residential mortgage sector, surrounded by legislation put in place in the 1930s to promote home ownership. Hardly a likely candidate to cause what became known as the biggest financial scandal in the US. But things change. Between 1960 and 1980 that environment changed out of recognition. Particularly in the 1970s, the interest rate market became increasingly volatile as inflation soared. Mandated to offer a low interest rate that they could offer to depositors, the S&L industry lost its competitiveness for funds with commercial banks and securities markets, leading to lesser amounts of money available for mortgage lending. Deregulation in the early 1980s removed the abovementioned deposit interest rate ceilings, increasing the competitiveness of S&Ls in sourcing for depositor funds. A new problem was brewing: by raising their cost of funding, margin pressure was created on the income generated by their mortgage loans. What was worse, the liabilities (deposits) were short-term, while the assets (mortgage loans) were long-term, typically fixed-rate interest --- a so-called asset-liability mismatch. Between 1980 and 1982, regulators, industry lobbyists and legislators put together various legislative and regulatory mechanisms to postpone the threatened insolvency of the sector in the hope that interest rates would quieten down and S&Ls would be able to engineer themselves back into profitability. The approach was to loosen S&L capital restrictions, while offering S&Ls new freedom to extend their activities into potentially lucrative (and therefore risky) areas --- which planted the seeds for the next crisis. S&Ls were allowed to sell their mortgage loans and use the cash generated to seek better returns. In particular, S&Ls began to both lend to real estate developers and to invest in real estate, construction and service companies. In key regions, such as Texas and Florida, S&L lenders competed with other lenders such as commercial bankers to fuel a real-estate boom. And yet, the traditional risk management skills of mortgage lenders, where credit risk is relatively low and predictable, and property and collateral prices relatively stable, did not equip most S&Ls to venture into the strongly cyclical commercial real estate market. A mismanagement of investment risk, driven by greed for high yields, characterise both the S&L crisis and the current sub-prime crisis. The mid to late 1980s saw the long-term impact of such risk mismanagement. A series of US regional crises, triggered by collapses in the oil, property and farming sectors, acted to realise the credit and investment risks now embedded in S&L portfolios. For example, the oil-price inspired boom of the early 1980s in Texas was faltering, and by 1987 its oil and real estate sectors were in deep recession. A similar process of increasing rates of default and falling collateral values remorselessly undermined S&L asset around the US, right through until 1992. Realising the threat of insolvency facing many S&Ls, from 1986 onwards, politicians and regulators struggled with a series of measures to fund the restructuring of the industry, but these failed to match up to the scale of the problem. Much of the restructuring was accomplished through encouraging mergers and acquisitions between S&Ls. Public awareness of the enormous scale of the S&L crisis continued to be relatively muted into the late 1980s, surprisingly, until 1989 when a new Act was passed that substantially restructured US financial industry regulation and belatedly recognised that US taxpayers would end up paying much of the bill for the S&L fiasco. Regulators began to act aggressively to close down S&L institutions, though it quickly became clear that the situation in the S&L industry was even worse than had been imagined. In 1989 and 1990 the S&L crisis reached its height in terms of public expense, with total bailout expense (taxpayers' money) estimated in the hundreds of billions. It contributed to the large budget deficits of the early 1990s, and the resulting slowdown in the finance industry and the real estate market may have been a contributing cause of the 1990-1991 economic recession. The episode is a prime example of the dangers of deregulation, especially for financial institutions. With the withdrawal of regulatory oversight coupled with mismanagement, there is great potential for excessive risk-taking. It also illustrates how formalistic reporting of the financial condition of S&Ls was deliberately selected by interested parties to cover up the true economic extent of the unfolding disaster, truly a risk-reporting failure on a grand scale.